I have collaborated with others since I began making art. The crossovers started in small ways because as a young artist I was very much concerned with control. My first true collaboration was with Brent Aldrich, for our aptly named group DENT. Together we initiated performances, not for an audience but for the camera. We wondered if we could change the our relationship to landscape, the notion of natural vs artifice, and to the notion of ownership through simple and historic gestures like planting flags. My love for collaboration is cultivated by the fearlessness to experiment, the capacity to be ambitious, and that other person pushing for more. For me, I worked in ways that I couldn’t individually. When I moved on to grad school, I left my collaborator. I embarked on a project that was completely uncomfortable, I ran for Homecoming Queen. I hated performing, but it was beautiful. This project, produced during the first semester of grad school, brought my peers and I together which would turn out to be catalyst for collaboration in the future. Right now I’m actively collaborating with Radar Collective on the nationally touring project, Barter Boat. A project which was born from our desire to collect and to share. 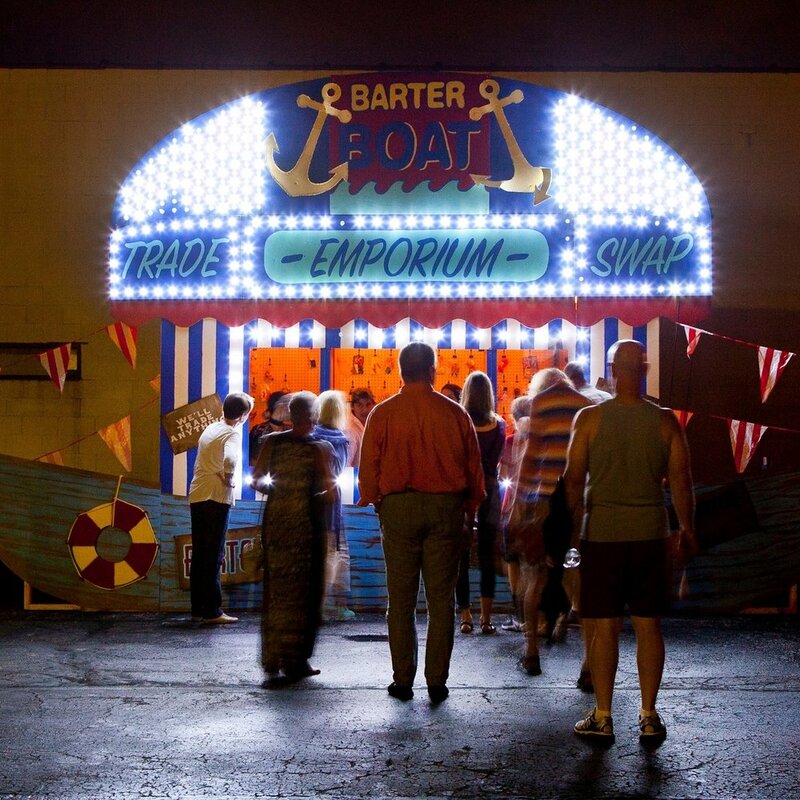 My collaborators Anna Abhau Elliott and Robin Schwartzman and I travel from city to city in our intrepid Barter Boat (okay, it’s a carnival stand that looks like a boat) trading with the citizenry. So far we’ve traded in Minneapolis, Indianapolis, Baltimore, Atlanta and Scottsdale is on the docket. We have curated our collections from these cities into hand-held assemblages. Those who trade with us are given one of these precious packets, an eco-friendly bag carefully curated with the small possessions of passersby in a far-off city. In turn, whatever we collect will become art too, and traded at our next stop. From the mundane to the superb, from the pocket lint to the beloved action figure, we want it. Your trash is our treasure. We’re looking at you Florida! I’m also collaborating with Kale Roberts on his dreamy mobile art and performance space Tailgate Projects. Think of tailgating but with art instead of sports, yeah, it’s awesome! As a method of public intervention, Tailgate Projects, sets up shop with a group of artists set to perform, show work, and initiate their own actions, and invites the community to participate, to grill and eat, and enjoy a myriad of art from local and international makers during each event. Keep your eyes peeled for our first event in December. The projects are based in interaction and are accessible to a great diversity of participants outside of the gallery and lovers of art. Connecting with others through art processes in comfortable settings has opened up the possibilities of what art can do. Art has always been a relationship between the maker and viewer. A capacity to share and understand a moment, emotion, or concept through physical rendering. I am drawn to performative and interactive art because it asks you not just to connect with your eyes and mind but perhaps to talk, touch, jump, crawl, and imagine in ways you’ve never before. As an artist facilitating this type of temporary and site specific art we get to interact with those who choose to participate in new and more connected ways. I spent the majority of Thursday not thinking about the 2017 Emerging Artist New Work Exhibition Opening Reception from 6pm - 9pm. I actively distracted myself by calling an airline that owed me a refund and spending about an hour and half on the phone. We’ll see in 8 weeks. I continued the day by spending 3 more hours on the phone...I am not a phone person. Admittedly, I was nervous, hesitant, but also thrilled. My project, Ends Meet, is an experiment. I used the opportunity of support from Creative Pinellas to push my work past my familiar boundaries. This had me walking on pins and needles because I had not had enough time to digest the work and yet in hours a diverse audience would attempt to do just that. When the doors opened, and the crowd thickened, those who turned to a set of black drawn curtains and bravely moved through the threshold quieted in concentration and slowed in step. And that was really all I wanted. The audience though, welcomed my project with interest. I found that many had the willingness to concentrate and consider when presented with new concepts and actually yearned for those boundaries of media and disciplines to be crossed. I’ve been actively challenging myself to remove expectations and to instead be present in time. The more I practice this, the more stunned I am by the those in the Pinellas County and their amazing curiosity. The night was a buzz and I felt proud to be a part of a very talented group of artists. I always conveniently forget the manual labor hours needed to successfully pull off an installation. Maybe because I spend so much time working with screens I forget about the physical manifestation. Not that I’ve embarked down this road many times – typically my work is presented on a screen from the small selection of screens a gallery has available. In some cases, there is a bit more involved like hanging a screen and projector from a ceiling, installing pedestals and similar but I have to admit that it has most always been done for me. But this time, I spent the last week executing an idea which existed only in my mind. I learned how to build a pedestal, how to navigate the aisles of hardware stores and confidently gather materials, how to drill,cut, sand, screw, and paint like a boss. Desiree blacks out the beautiful light. Desiree moves things, many times. After this week of introduction to basic building methods and assistance by my friend Kale Roberts, I feel physically stronger and more capable than before. Not just about building though, but about navigating through life with a new confidence too. The part of the process I can’t document are the hours of planning cutting plans and rethinking. What I don’t show, are the actual construction of the pedestals, or the 150 yards of fabric that ran through my fingers or the hours waiting for paint and spackle to dry. And I sort of love it. I love that the space looks effortless, clean and minimal. Here’s a sneak peak. Way back, when I was an undergrad studying Photography, my mentor and professor, Linda Adele Goodine, asked me one question which ultimately transformed my way of thinking about art. Ends Meet, Still from Video, currently work in progress. 2017. Looking back I’m surprised that someone had to shake me in this way, but nevertheless. In the basement of Herron School of Art and Design sat the Photography lab. It was late, I think, but hard to tell when you haven’t greeted the sun all day. A handful of us were selected for a special exhibition that would culminate in a scholarship. We were all in the basement scrambling to finish up our pieces and install them in the gallery. Don’t judge, but I had grabbed my frames from Walmart…they looked okay, I thought. The way she said it was so sincere, and flat. She was serious. She was right. I had created work that I was proud of, that I had labored over and my nonchalance about the presentation of that work destroyed its potential. Even now, as a Video artist, presentation considerations are still crucial to the works I make. For example, one film is supposed to be shown at the Drive-In, a triptych of videos are shown on 3, 11-inch white tube televisions, another video is shown on a 11-inch tube TV with a clear housing, another 5-channel film is shown on 5 flat screen monitors in a U shape around a singular stool. 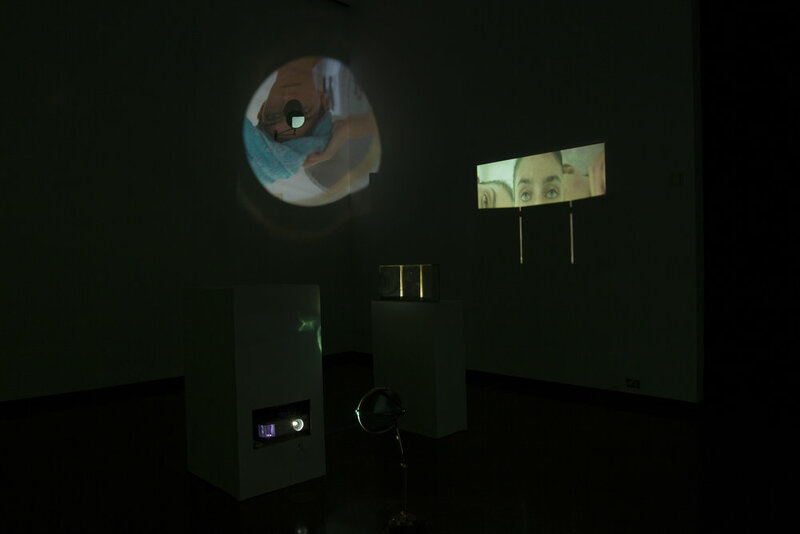 Ends Meet, documentation of installation, currently work in progress. 2017. From a conceptual level, the ways in which women present themselves differently in various scenarios as an effort fulfill the many roles we are expected to perform drives this project. To compartmentalize ourselves is innate, perhaps, ingrained. I wonder if this daily performance of an individuals’ many selves begins to erode the true nature of her identity. I wonder how many women are asking, Who am I? Ends Meet, is based on this curiosity. And the foundation of presentation, both in content and execution, challenges me to develop a work that is intentionally rooted in form as well. Ends Meet is currently in progress. The documentation here may or may not reflect what will be presented for the Creative Pinellas Emerging Artists Exhibition in October. The following images are documentation of tests done in my living room, hence the blinds. I collect stories, memories, and moments. I do not subscribe to the romantic notion of the creative genius - the inspiration to create is a calculated choice. For me, inspiration has to do with observation and because I create characters, every person is a potential muse. Much of my art practice is listening, watching, and encouraging tales to be told. Lengthy, tangent-stricken conversations lead to memories not necessarily deemed important but usually the most insightful. The telepathy between best friends, the transformative qualities of a gesture or phrase out of context, the countless little things we do alone we don’t dare admit, and the hiccups in propriety after intimate confessions are just a few of moments I’ve collected. My notes from years ago may mashup with a sight or sound from a minute ago. I work the pieces and manipulate their edges until they fit together and a character is born. Of course, artwork is inspirational too. I am currently on pins and needles after watching Chantal Akerman’s 3 hour study of a mother. …I collect things too. In some ways these things, out in the world, give form to feminine experience I’m trying to understand. Here is a recent acquisition I can't keep my eyes off of. Just a normal advertisement. It's no secret. While I didn’t expose this connection until recently, it is clear to me that my practice, the way I make films, all has to do with a cardboard box full of photographs (more on this in future posts). 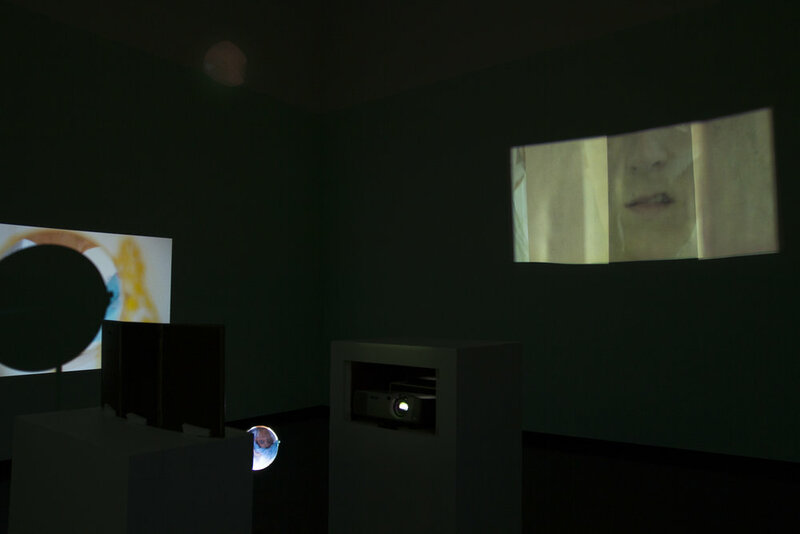 Still from Over and Under and Through, 22:04, currently on view at The John and Mable Ringling Museum of Art, Sarasota. The physicality of the photograph has always attracted me. The worn edges, the illegible script, the awfully wonderful candid compositions. It was my mother’s way of storing her memories that had a great affect on me. Under her bed, in an unassuming white cardboard box were hundreds of photos thrown haphazardly. The only photographs framed and on view were of recent, tangible events. But in the box, were images from my mom’s past life - the one before me. In one photograph, she is twenty in New York with only the caption “see graffiti” and in the next, her hair is feathered with glasses consuming her face topped off by a peculiar smirk. And others, too complex for me to understand at the time. Impulsively, I began to fit images together like a jigsaw puzzle trying to establish a timeline. The gaps between snapshots allowed me to envisage a narrative, albeit full of non-truths and unrealistic leaps. While the reason I make films has to do with my mother. Robin, clashed with familiar feminine stereotypes but she was not immune to them either. As the only parent in my world, the traits commonly associated with male and female co-mingled in her changing my perception and also my acceptance of these established expectations. I have had the opportunity to work on several large scale film productions only to be met by such compliments as “I hope you’re here tomorrow, we need something to look at” and when hired as 1st AC the Director of Photography refused to let me hold the camera rig and instead handed it to a male lighting grip (which is definitely not how it works). Filmmaking is my medium because I’m not supposed to be behind the camera. A woman's role has traditionally been in front of the camera with soft focus, a hair light, and performing a character written by a man. Unfortunately, growing up girls establish their own sense of self through these very characters on film. The male gaze stretches far and wide. The male gaze and that method of looking at and thinking of women trickles down to all us - including me. My films depict the intimate spaces that girls and women inhabit together to reveal aspects of femininity not necessarily beautiful or desirable but instead sincere. My characters too, are granted with a keen sense of awareness of their subject hood and force the viewer to reconcile their thoughts and expectations from frame to frame. When they tell you to smile, bare your teeth. Desireé Moore is film, video and media artist based in St. Petersburg, FL. She uses film and the nuance of time, color and play to dissect the roles and representations of women. Her films have shown nationally and internationally in theaters, drive-ins, and museums. Currently, her work is on view at the John and Mable Ringling Museum as a part of the Skyway exhibition. Moore has collaborated as the Director and Editor of What the Bringback Brought, the debut film project by artist Trenton Doyle Hancock. 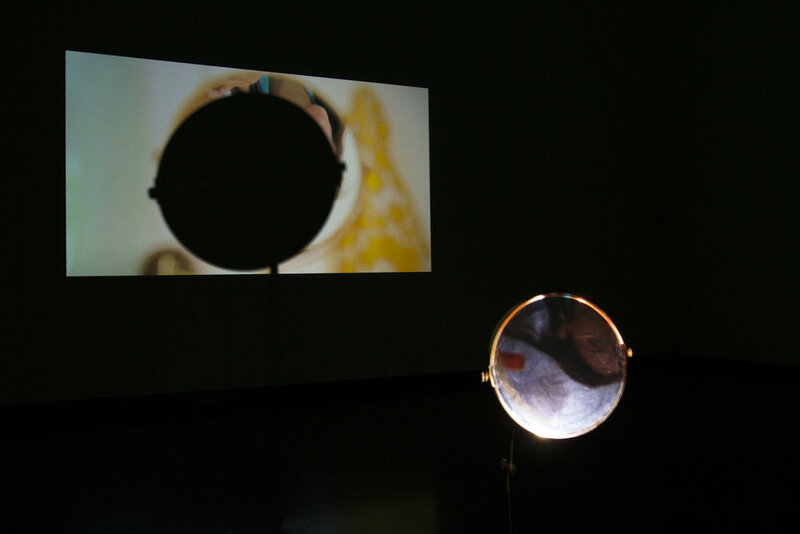 The Creative Pinellas Emerging Artist Grant will assist in the production of new video work and elements of presentation to culminate in Moore's first solo exhibition by years' end.